I have started to document my journeys out with my camera, it will help me looking back at my adventures and help you to get closer to my thoughts and expressions in Photography. I welcome comments and suggestions, especially on locations to visit. Please comment below to suggest locations. I looked at the weather, rain, clouds and sun, a typical North Wales summers day I thought, great for Landscape Photography too! Where shall I go? Its bank holiday weekend so it would be busy, I needed a place where I could get away from the crowds, maybe the weather will deter some people. I knew I wasn’t going to make sunrise given the 2 hour drive and poor forecast first thing. 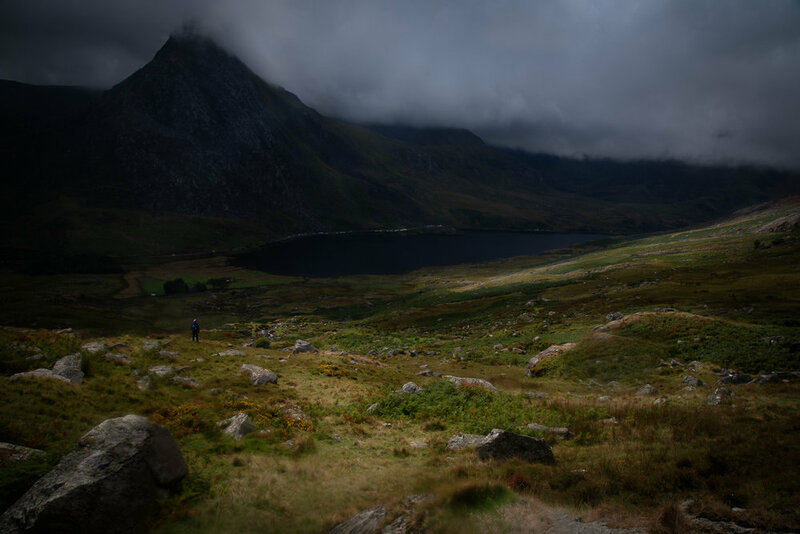 I decided on Llyn Ogwen which can be reached along the A5 which runs through Snowdonia national park. I googled images from here and done the typical “Check You Tube” out, and this location looked good. My plan was to walk up the eastern side of the lake as from here there is a stream that runs down the mountain side towards the lake, as well as a few small waterfalls which could act as come good foreground interest. 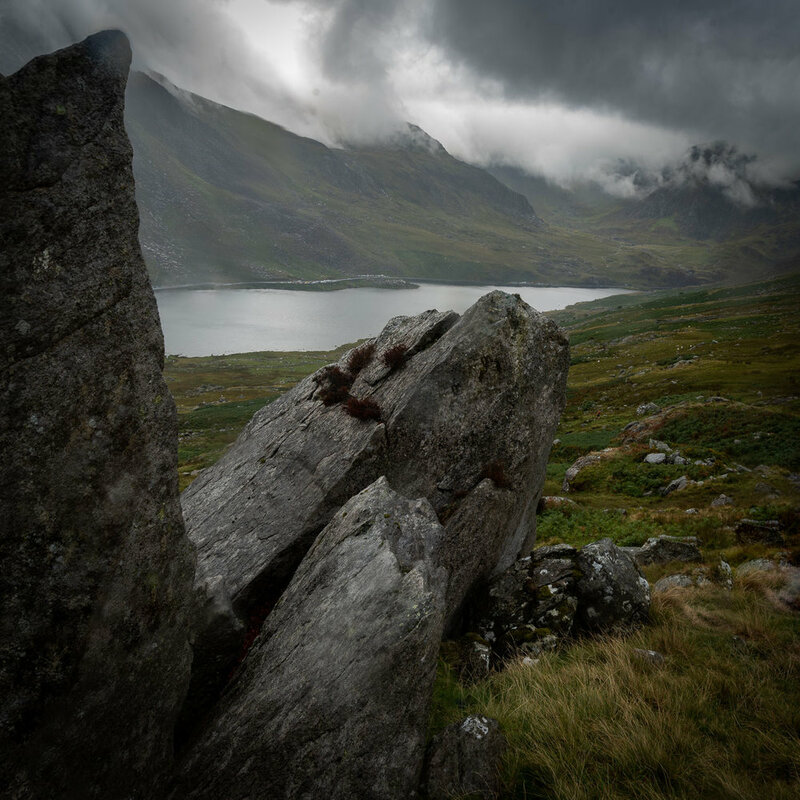 The mountain Tryfan is also opposite which would add a great backdrop to the image. After Parking along the A5 wrapped up in waterproofs I set off up the mountain, I did not intend to hike the whole way just as far as to tick off the image I had in my head. Then the heavens opened and it rained and rained. When it stopped I managed to capture my 1st image but quickly realised I needed to be higher up. It was so hard keeping the lens clean and using the Lee filters (Polarizer, ND and ND Grads) it was almost impossible to keep the water off. I made it up to the waterfalls and stream where I could get a good view of Tryfan and Llyn Ogwen and I was looking for a composition where the stream ran through the image from left to right and I had both the Mountain and the Lake in the frame. Camera on tripod, using the Lee Polarizer, 0.9 Medium edge ND Grad and the little stopper (6 Stop ND Filter) with a 2 second timer I captured a few images I like. After it stopped raining, sun, then clouds, then hale, more sun and some rain, as well as lunch I decided to head back down with no idea if the images I took where keepers or not. I had already notice many images had water drops, so I knew I would need to use Photoshop to correct this. It’s interesting when hiking up a mountain I always think the worst part is going up, but it’s often the journey down which is just as difficult, and it certainly was the case here, slipping twice on the way down with knees shaking I made it back to the car. As soon as I got home I uploaded the images into Lightroom and quickly sorted the keepers from those ruined, which there was quite a few due to the rain. I was happy with some images I took and I have shared them on my website, I hope you like them. Nikon D750, Sigma 24-105 F4 Art, Lee Landscape Polarizer, Lee Little Stopper, 0.9 Medium ND Grad, 0.6 Soft ND Grad.